The Virginia state seal identifies government buildings and officials and is a centerpiece for the Virginia state flag. The symbolism, history and emblems of the Virginia seal are described in this article with fast facts and information. Fact 3: The reverse of the seal pictures the blessings of freedom and peace, as represented by three Roman goddesses, Libertas, Ceres, and Aeternitas. The central female figure in the center of the Virginia seal depicts the Roman goddess Virtus. Virtus was the deity of bravery and military strength and symbolizes the spirit of the Commonwealth. Virginia officially uses the name "Commonwealth" emphasizing that they have a "government based on the common consent of the people" as opposed to government legitimized through their earlier royal colony status of Great Britain. The Goddess Virtus was usually depicted by the Romans carrying a sword and a spear and wearing a helmet. She symbolizes character, worth, and courage. 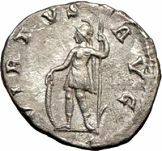 The foot of Virtus stands on a defeated man who symbolizes tyranny. The tyrant is pictured with a broken chain in his left hand, a scourge in his right hand implying struggle that has ended in complete victory. An image of a fallen crown lies nearby, symbolizing the end of the sovereignty of Great Britain following the American victory in the Revolutionary War of Independence (1775–1783). 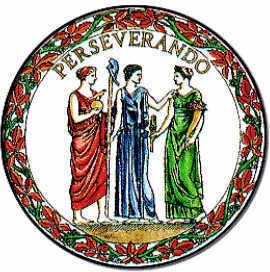 On the reverse side of the Virginia State seal are the three Roman goddesses, Libertas (Liberty. a quasi-mythical goddess) in the center holding a staff and pileus (liberty cap) in her right hand, Aerternitas (Eternity) with a globe and phoenix in her right hand, and Ceres (Fruitfulness) with a cornucopia (horn of plenty) in her left hand an ear of wheat in her right. At the top is the Latin word 'Perservando' meaning "by Persevering"). Both sides of the seal are surrounded by a border design of Virginia creeper. 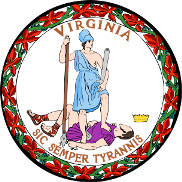 The Virginia State seal is kept and used as required by the Constitution and laws of the state. This is flyer depicting an early image of the Virginia state seal. The pictures surrounding the seal are interesting. One reflects the beaty of the landscape and we believe that the other image of a colonial surveyor, which we believe is using a zenith sector. The most accurate scientific instrument of that period was the zenith sector which was a telescopic instrument used for measuring distances. Official Virginia Nickname "Old Dominion"